Being an artist isn't a 9 to 5 thing. 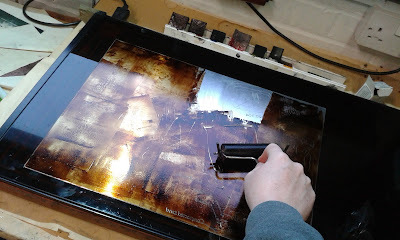 Neither is setting up your own business so with both vying for head space over the last few months (and throw in an aged parent with dementia for good measure), there hasn't been a whole lot of etching going on. With Imprint 2 only a couple of months away though, it's time to get back to my core business. Also on at Pallant House at the moment is a selection of work by WWII Official War Artist Evelyn Dunbar (1906 – 1960). The show consists mostly of paintings, drawings and illustrations found in the attic of a relative's home and not seen before. 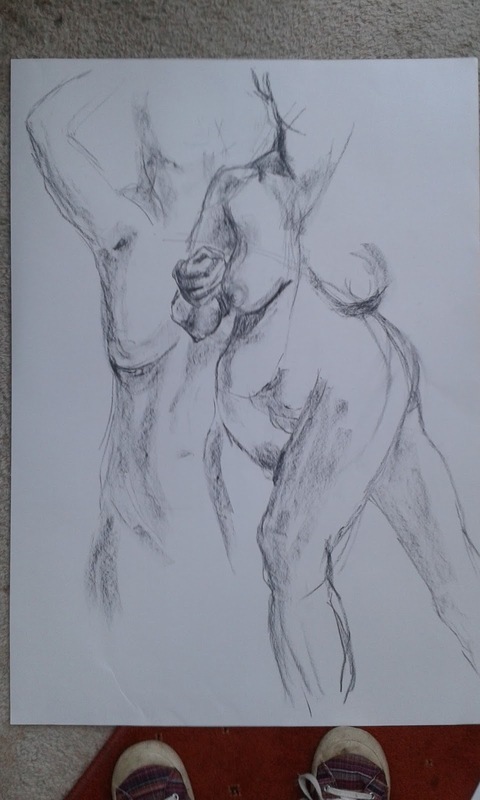 Mostly studies, these have been brought together with the finished works from public and private collections. 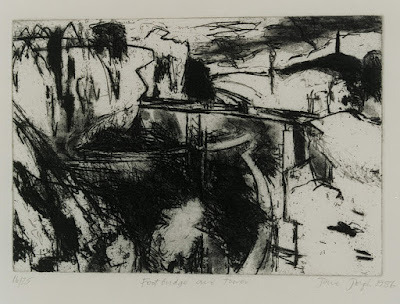 These works are rarely seen also so it's a bit of a privilege to see them now. Dunbar was quite versatile and had different styles according to project in hand but it's the 'domestic' war scenes I really like. 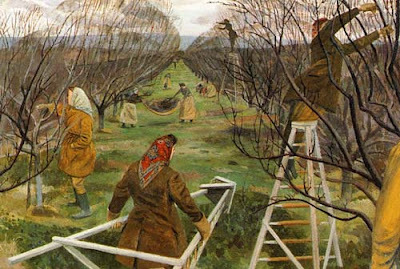 Part of me harrumphed that 'the little woman' had been kept at home and not sent to document the 'real' war stuff, but of course, the domestic was just as important to record as part of the war effort. These paintings are rather Spenceresque; the shapes of the figures, the composition and colours. I think it's rather a shame though that Dunbar's work was squished into three small, dark rooms whilst David Jones was languishing in the more spacious upstairs galleries. 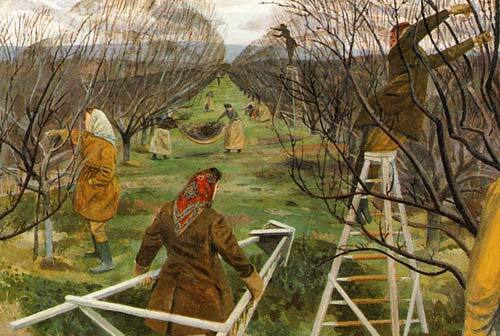 Flying Apple Pickers, a painting I particularly liked, could hardly be seen as it was hung on a piece of wall sticking out into the space only a couple of feet wide - the painting just fitted. 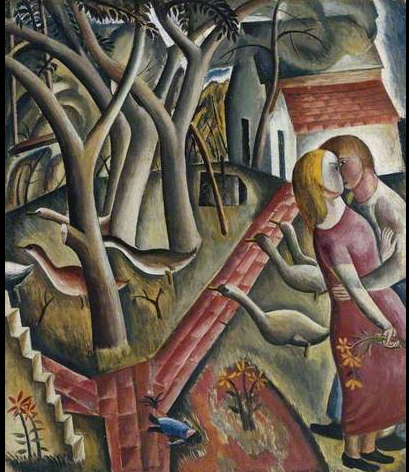 Visited Pallant House last week to see the David Jones and Evelyn Dunbar exhibitions. 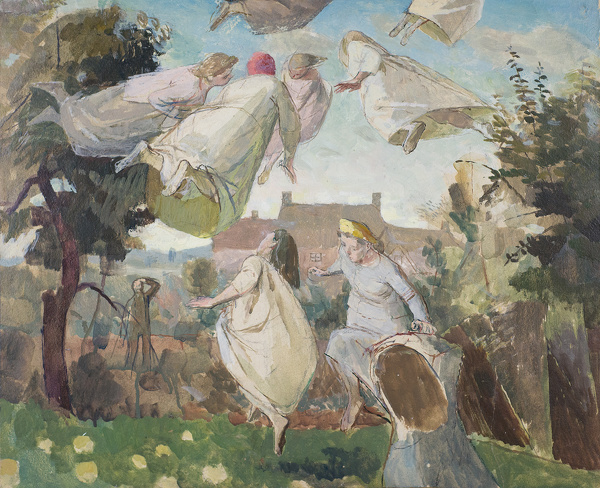 Mostly it was the David Jones that drew me as there have been reviews nationally, but actually, it's the Evelyn Dunbar that's worth seeing. There is a lot of Jones's work on display - five or six rooms in the main gallery. 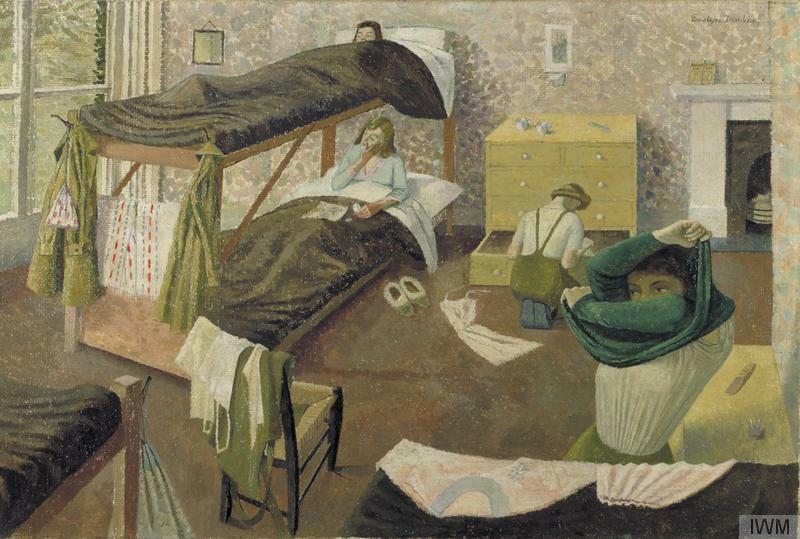 Evelyn Dunbar's work on the other hand is squished into three small rooms downstairs. Much more varied and accomplished than Jones's. And she deserves her own post so I shan't tack her on to the end of this one. 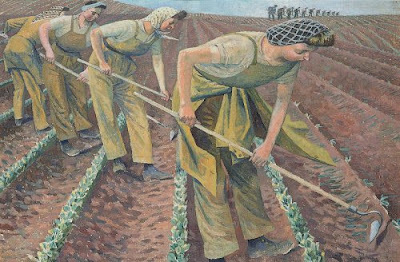 Interesting exhibition of drawings, etchings and linocuts by Jane Joseph on at Southampton City Art Gallery at the moment. 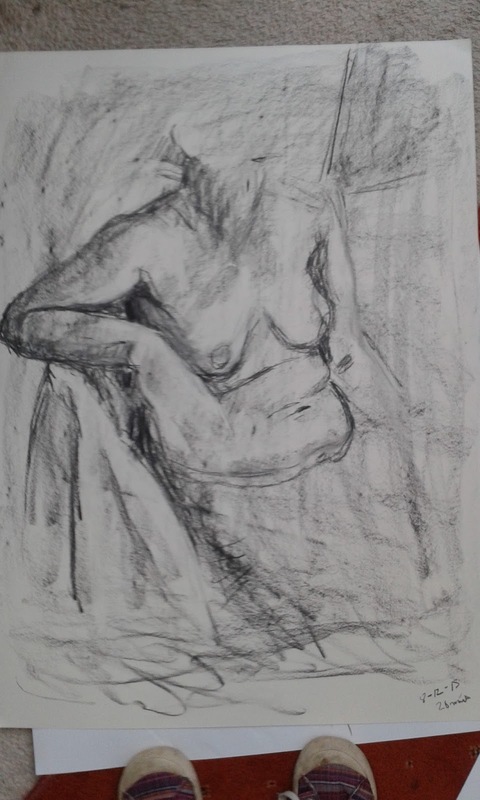 I like the large charcoal drawings. The artist has also curated an exhibition of drawings from the gallery's collection which is more interesting (to me at least). A couple of Auerbach's in there. 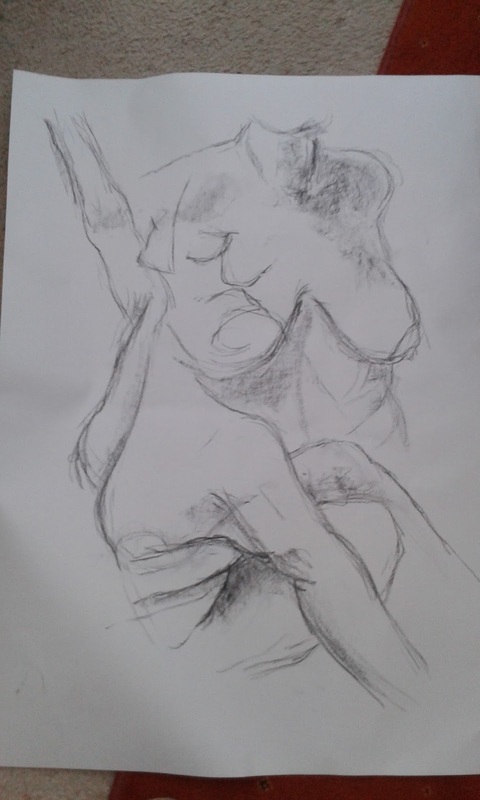 It was our last life drawing session of the term this week. 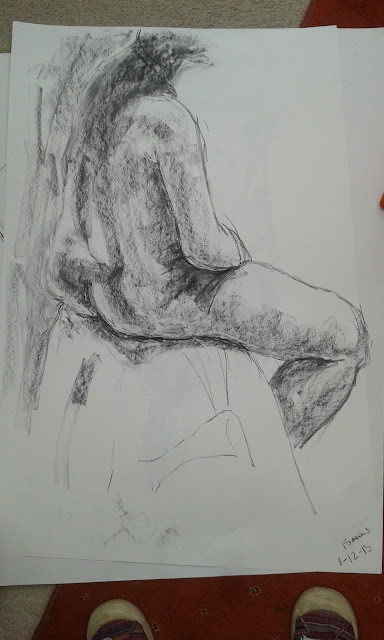 I was hoping to sign up for next term but very sadly, the gallery is havng to move premises at very short notice so no more sessions until they find a new venue. Gutted. Going to have to have a swift rethink over the Christmas period as I don't want to lose the momentum I've built up over the last four months. And I've only just begun my painting adventure! 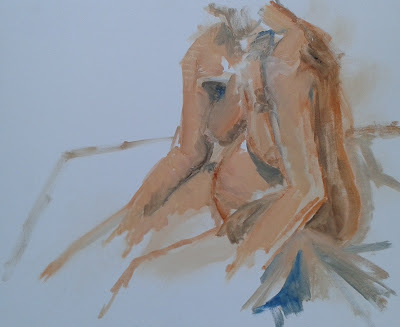 I don't have an awful lot to show for the last couple of weeks at life drawing as I have begun to paint in the sessions, and as I'm completely new to this, the results are somewhat ropey. 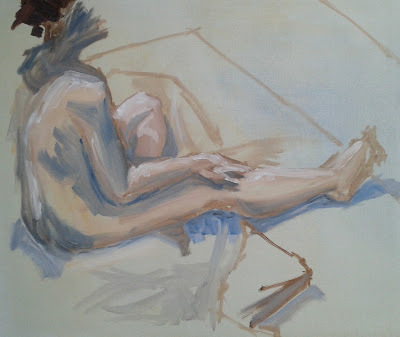 This first image is from the long pose at the end of the session, about 45 minutes, and is nothing more than a rough sketch in oils. The week before I had longer, over an hour, but what I produced was terrible so I wiped it all off and reused the board this week. 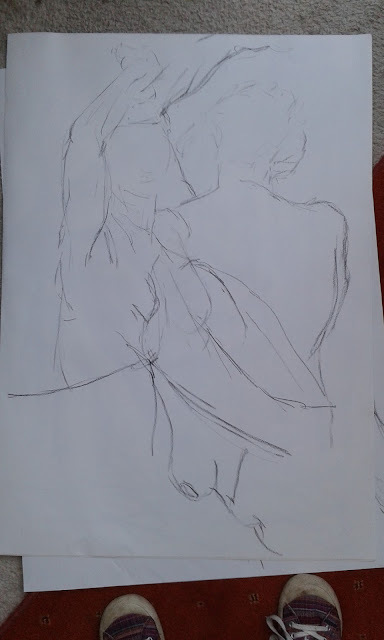 It's going to take me a long time to master this I think but I'm really enjoying the process so far, even though the end product is no good. 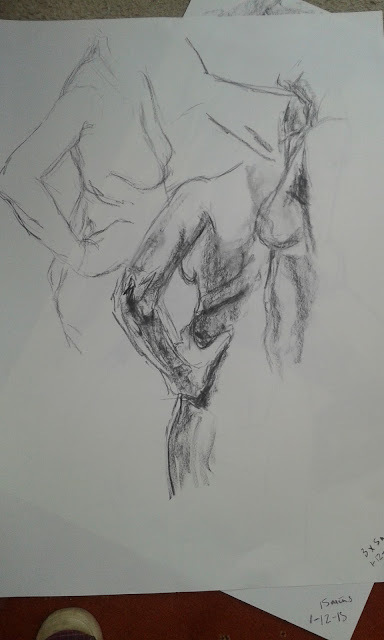 I have been making drawings during the short poses to get my eye in and because there isn't really time to paint then.